The 9 a.m. service in the Church is a traditional Rite II Eucharist. Our choristers (boys and girls) along with staff singers and organ lead the congregation in hymns and service music. They also sing an Offertory anthem. Children and parents who prefer a more formal service are among those who attend, as well as a large cross-section of adults. Lectors and acolytes serving at this service include teenage parishioners. This service uses the Book of Common Prayer and Hymnal. Children’s Chapel, designed for children 3-7, occurs during an early portion of the service, and then children return to their parents to participate in Holy Communion. Video recordings of this service are posted on this page every week. This joy-filled, casual, communion service is for children ages 0-5 and their parents. The music is led from a keyboard. The service features an accessible children’s sermon that often features videos. The service meets in the Saint Michael Chapel. The 11:00 a.m. service in the Church is a traditional Rite I Eucharist. The adult choir and organ lead the congregation in hymns and service music. As a more musically substantial service, the choir also sings the Psalm, an Offertory anthem, a Communion motet, and on some Sundays, a Choral Mass setting. The greatest feast days also regularly include orchestra. A cross-section of the parish attends this service, which uses the Book of Common Prayer and Hymnal. On feast days, this service features incense. This casual communion service is in contemporary language and has band-led worship music. The service features an in-depth, practical sermon for adults. It meets in the Parish Hall. Video recordings of this service are posted on this page every week. The 5:30 p.m. service in the Saint Michael Chapel is a traditional Rite I Evening Prayer and Eucharist. The service features hymns led by a cantor and organ. Worshipers often attend in casual attire to end their weekend in a relaxed setting. This service uses the Book of Common Prayer and Hymnal. Once a month, the service is in the Church and is a Choral Evensong with Holy Eucharist. Designed as the concluding prayer of our day, Choral Compline is a meditative, candlelight service in the Church. Compline centers around Psalms, scriptures, and prayers from scriptures. Music, primarily Gregorian chant and Renaissance polyphony, is provided the Compline Choir unaccompanied by instruments. The service lasts less than 30 minutes. The Daily Office of Morning Prayer is held each Monday, Wednesday, and Friday in the Bishop Moore Chapel. Join in this practice of daily prayer as it perfectly expresses our religious identity. As Augustine said, the Daily Office helps us “become what we are” – baptized men and women. This service is lay-led and uses the Book of Common Prayer. This service uses the Book of Common Prayer. A member of the clergy officiates at a service for healing with Eucharist in the Bishop Moore Chapel each Wednesday at 10 a.m. The sacrament of Unction is offered to all who desire it. This service uses the Book of Common Prayer and special prayers for healing. 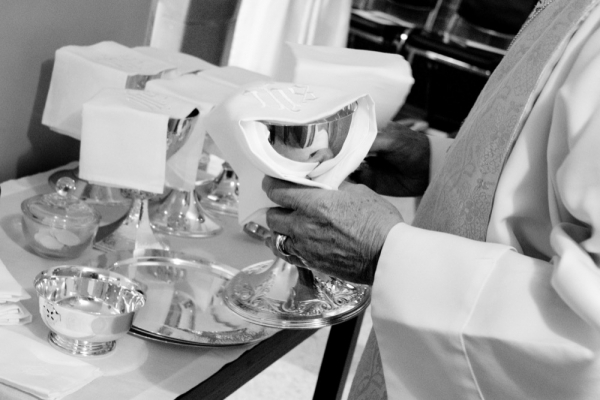 A traditional Rite I Eucharist is held each Saturday at 8:30 a.m. At the Celebrant’s discretion, a short homily may be given. This service uses the Book of Common Prayer.